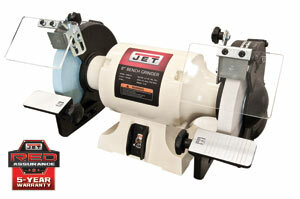 This 8" Slow Speed Bench Grinder from Jet is designed with features for convenience and smooth operation with heavy duty construction. It includes tool rests and two Norton® Grinding Wheels as standard equipment. JET’s innovative tool rests on the grinder have a larger platform area and an integrated angle indicator. Reference lines on the platform are used for easy alignment of the tool. This grinder is made with premium components for dependable accurate sharpening for many years to come. An additional $25 will be added to regular Shipping & Handling for the grinder. Air shipping and international shipping is not available. Shipping to 48 contiguous states only.